As I write this, our country is still reeling from the devastating aftermath of Typhoon Sendong (international name Washi) in Mindanao. My heart and prayers go out to all the families, especially the women and children, who have been displaced, lost their home and even their loved ones. I have requested for the release of my Priority Development Assistance Fund (PDAF) for these areas. In the meantime, I have tried to bring their cause to the consciousness of the people around me, including the runners I run with “virtually” everyday for over a week now. 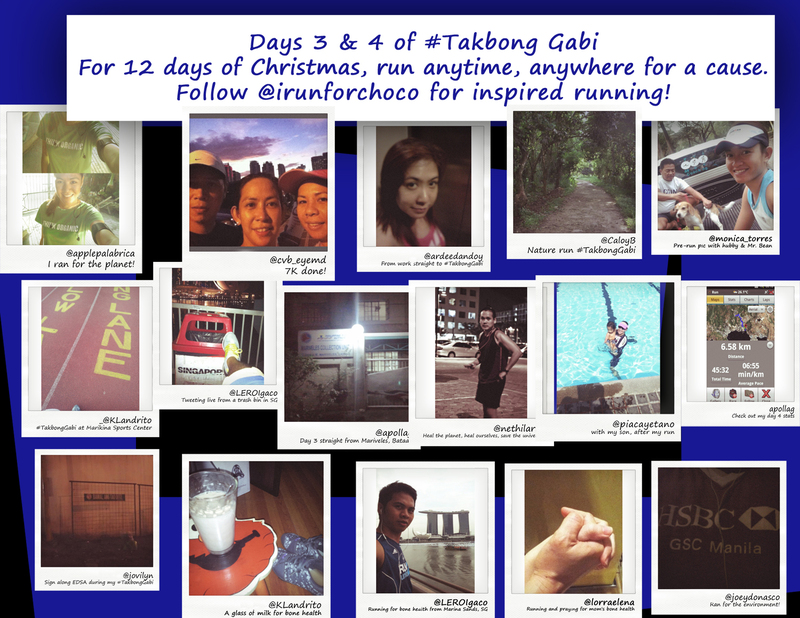 On Sunday, the 7th day of Takbong Gabi, we dedicated our run to the people affected by Sendong. And that’s the beauty of Takbong Gabi. Being a Twitter-based advocacy run, we get to run for a different cause each day. Participants run anytime, anywhere for 12 days from December 12 to December 24. We’ve been getting more followers daily which simply means more people are running and/or spreading the advocacies. On day 3, we ran for the planet – for recycling and waste segregation. The Solid Waste Management Act (RA 9003) requires segregation at source, with separately marked containers depending on use – recyclable, non-recyclable, biodegrable, non-biodegrable, household and compost waste, among others. Of the total solid waste that end up in landfills, a whopping 95% can still be reused or recycled (45%) or turned into compost (50%). According to the Department of Environment and Natural Resources (DENR), Metro Manila (MM) generates 6,169 tons of garbage daily but only 25% of waste generated is recycled. Paper accounts for 12% of MM’s solid waste that goes to dumpsites. Meaning, 840 tons of away daily – equal to 14,280 trees. Plastics, which account for 25% of MM’s solid waste, require 100 to 400 years to break down. This is one of the causes I’ve been staunchly advocating since I became a Senator and I ran hard for it last Wednesday. Here’s a photo with my son, Lucas, cooling off in our pool after my Takbong Gabi run. It’s deadly especially among the elderly – 20% of those who have a hip fracture are dead in 12 months while 30% never walk again, according to studies by the International Osteoporosis Society. But it’s not just an old person’s disease; bone breakdown can begin as early as the age of 25. Women between 25 to 50 years old should aim for 750mg of calcium daily and even more for those who are older, pregnant and lactating. My grandma, the original Iron Girl, suffered from osteoporosis. It pained me to see her lose her zest for life due to the disease. Osteoporosis has no cure but it can surely be prevented. Big thanks to everyone who’ve unselfishly given their time, energy and sweat for our different causes everyday. As promised, here’s another collage of Twitpics sent by our enthusiastic participants from in and out the Philippines. Keep sending photos of your workouts and don’t forget to share your location. We’ve got another surprise coming up in the coming days. If you see any humorous or interesting signs, landmarks and images along the way, snap away and tweet to @irunforchoco. For those who have missed a day or two, don’t fret. You’ve got until the end of the Yuletide season to make up for it. Just make sure to complete 12 days of inspired Christmas running.